For anyone pursuing fiber optic technician training, this article will help inform you about the basic guidelines in the placement of fiber optic cables in various indoor and outdoor set ups. In general, fiber optic cable can be installed with many of the same techniques used with conventional copper cables. The reason you need to do a site survey is to recognize situations in need of special attention. For example, physical hazards, such as high temperatures or operating machinery should be noted and the cable route planned accordingly. If there are questions regarding local building codes or regulations, they should be addressed to the authorities, such as the fire marshal or city building inspector. A cable pulling plan should communicate the points noted during the site survey to the installation team. These include the logistics of cable let-off/pulling equipment, the location of access points, splice locations and the specific responsibilities of each member of the installation team. Because fiber optic cable is sensitive to moisture, the cable end should be covered with an end cap, heavy tape or equivalent at all times. The let-off reel must never be neglected during a pull because excess or difficult pulls, center-pull or back feeding techniques may be employed. Fiber optic cable has an installation minimum bend radius value. During cable placement, it is really crucial that the cable not be bent to a smaller radius. After the cable has been installed, and the pulling tension removed, the cable may be bent to a radius no smaller than the long term application bend radius specification. While fiber optic cables are tougher than copper cables, it is still important that the cable maximum pulling tension not be exceeded during any phase of cable installation. In general, most cables designed for outdoor use have a strength rating of at least 600 lbs. 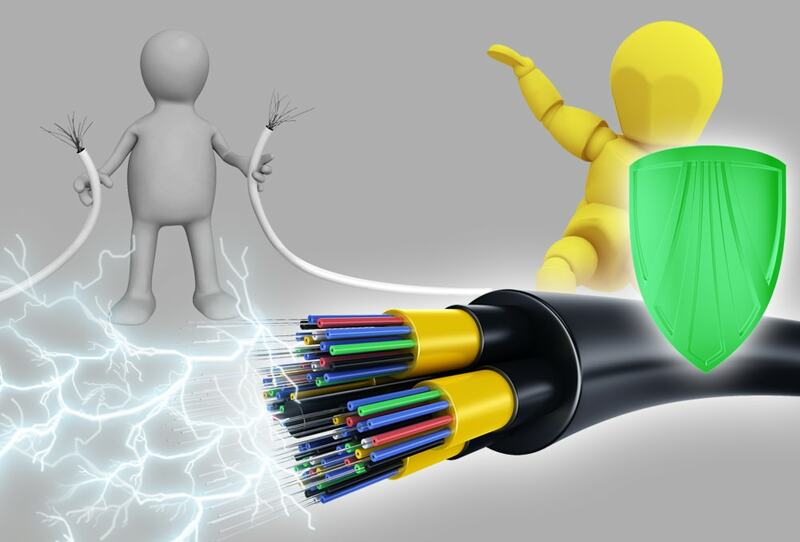 Fiber optic cables have a maximum recommended load value if intended to be used long term. After cable placement is complete the residual tension on the cable should be less than this value. For vertical installations, it is recommended that the cable be clamped at frequent intervals to prevent the cable weight from exceeding the maximum recommended long term load. Always leave extra cable at the beginning and at the end of the cable run. Also, extra cable should be placed at strategic points such as junction boxes, splice cases and cable vaults. Extra cable is needed in case cable repair or mid-span entry is required. Good record-keeping is crucial in any project. This will help to ensure that the cable plant is installed correctly and that future trouble shooting and upgrading will be simplified.